Wormholes reproduced in wood-printed illustrations dating back to the Middle Ages are offering researchers to track both the ecology of beetles and the spread of printing in Europe. 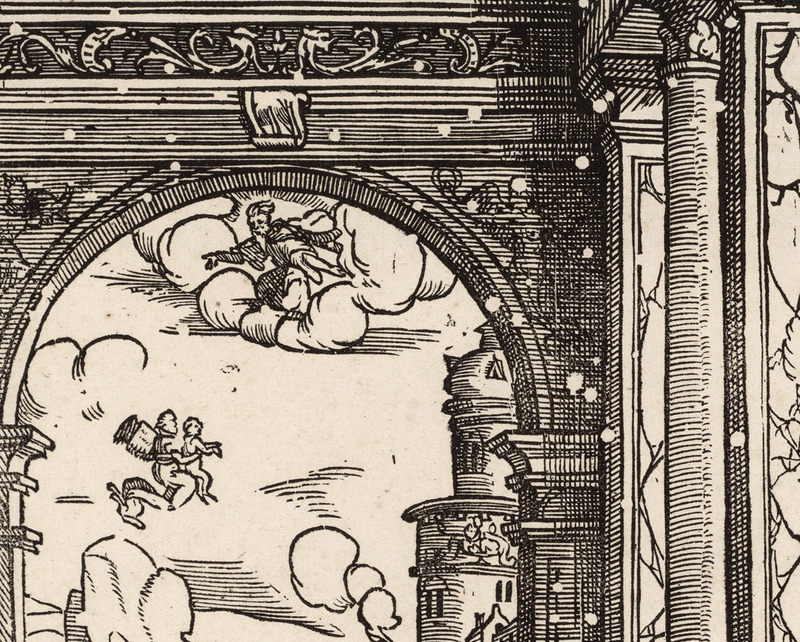 Blair Hedges, a professor of biology at Penn State University, has identified the species responsible for making the ever-present wormholes in European printed art since the 15th century. The hole-makers, two species of wood-boring beetles, are widely distributed today, but the “wormhole record,” as Hedges calls it, reveals a different pattern in the past, where the two species met along a zone across central Europe like a battle line of two armies. The research, which is the first of its kind to use printed art as a “trace fossil” to precisely date species and to identify their locations, was published last week in the journal Biology Letters. Hedges explained that most printed “wormholes” were formed in the carved woodblocks by adult insects and not by the worm-like larvae. After landing on a piece of dry wood, beetles lay their eggs in cracks and crevices. The larvae then spend three to four years burrowing inside the wood, nourishing themselves on the wood’s cellulose and growing until they enter the cocoon-like pupal stage when they transform into adults. The adult beetles then burrow straight up toward the surface of the wood, exiting to find a mate and to begin the life cycle anew. “The so-called ‘wormholes’ found in wood — including furniture, rafters, oak floors, and woodblocks that were used to print art in books — are not made by worms as the word suggests; rather, most are ‘exit holes’ made by those newly transformed adult beetles boring up to the surface and flying away,” Hedges said. Hedges measured the size of more than 3,000 printed wormholes in works of art and books spanning five centuries, from 1462 to 1899. He found that prints from northern Europe — including England, the Netherlands, Germany, and Sweden — had holes that were small and round, averaging 1.43 mm in width. However, woodcuts from southern Europe — including Spain, Portugal, most of France, and Italy — had larger holes averaging 2.30 mm in width, as well as some unique tracks, including long holes. “The species that made the wormholes were identified by a process of elimination. For example, the size of the beetle closely matches the size of the hole made, and most species have preferences for the wood they eat. This left two species as the probable hole-makers,” Hedges said. “The northern European wormholes most likely were made by the Common Furniture Beetle, Anobium punctatum. The wormholes in southern Europe most likely were made by the Mediterranean Furniture Beetle, Oligomerus ptilinoides.” Hedges added that, by comparing the diameters of the wormholes found in art from many different regions of Europe, he was able to determine that the Common Furniture Beetle lived only in a geographic area extending northward from northern France, Switzerland, and Austria, while the Mediterranean Furniture Beetle lived only south of that dividing line. “This is surprising because it means that the two species’ ranges were in close contact but, oddly, did not overlap along a precise dividing line,” Hedges said. 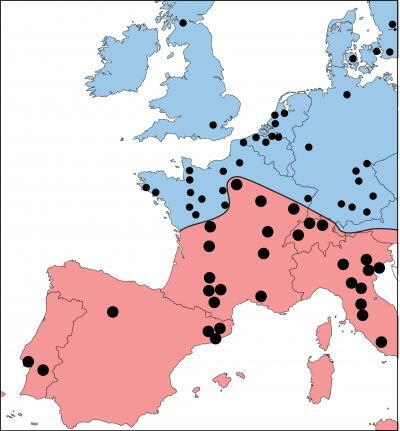 “However, today and for the past 100 years, because travel, shipping, and furniture transport tends to spread insects around, we find both species all over northern and southern Europe and elsewhere in the world.” Hedges suspects that the contact zone of the two species across Europe may have been maintained for centuries because of competition for the same food source. All of those details of the species’ distribution, including the contact zone, were previously unknown.